Custom T-Shirt Business is one of the best business ideas for 2019. Starting a custom t-shirt business it’s a pretty exciting idea. Along with setting your own schedule, unlimited income potential and flexibility, there are many perks to working for yourself. But, after you become an established company and you are making a nice profit, these perks often come. So, the first and foremost thing while starting this business is your hard work, time, and dedication. Those entrepreneurs who are artistically inclined while having an interest in serving the public; they can consider starting a custom T-shirt producing business. There is wide use of custom T-shirts, including businesses, bands, organizations, and individuals. And you’ll need some specialized equipment, such as a screen printing station, and knowledge of the screen printing process to produce high-quality T-shirts. 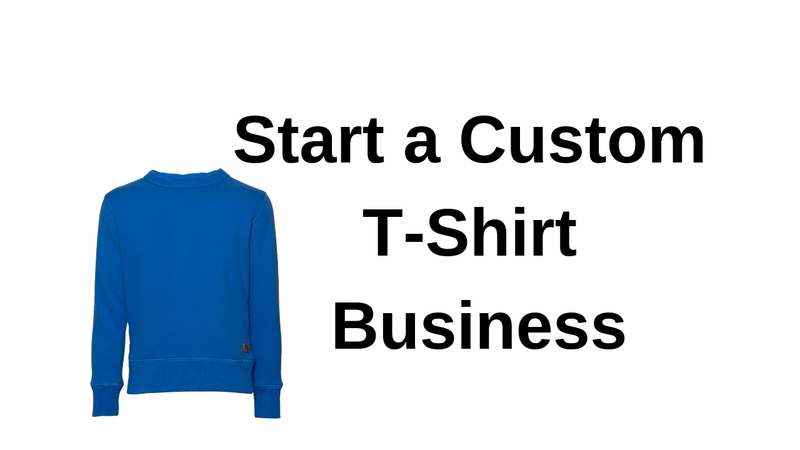 Why Start a Custom T-Shirt Business? Allowing people to custom design a shirt any way that they would like, custom T-Shirt business is an exciting new business. You’ll be well on your way to starting a lasting business in printing custom T-shirts when you’re master the process, provide professional customer service. Your T-Shirt will harness the power of computer sublimation to allow custom shirt printing in production runs as small as one unit while intelligently leveraging cutting edge technology. If you imagine the ability to create a totally custom shirt then you’ll choose the material and style of the shirt, and then the image or graphic you want on the front and/or back. As this is the ultimate form of expression, there are no limits to what you can communicate. Apart from these, some people might show their fanaticism for a particular sports team, others a musician. Also, you either may input a social message or cause on your shirt. From considering the competition to market research, there are many steps to follow while starting a custom t-shirt business. Also, you should think about how you will compete if there are other custom T-shirt producing businesses in your target market. On the other hand, it also may need to be competing with other types of businesses like custom embroidery shops. This is because it’s essential to focus on offering services that the competition can’t fulfill. Moreover, to create a unique business with excellent service, you must develop a solid business plan. Now, let’s know the steps that are important to follow while starting a custom t-shirt business. You have to perform research before writing a business plan and the plan must be based on the research. So, consider including more information about how you envision your business. Also, make a mission statement defining your business goals in it. Moreover, a detailed description of your business should be included in the plan. You’ll need to divide your time between production, marketing, and customer service for a custom T-shirt business. While production can be done in off hours, marketing and customer service should be done in regular business hours. Before starting a custom t-shirt business, you should fill out and file any legal and tax documents necessary at the local and national. Along with possible local and national permits or licenses that may be required, these forms will include a business and tax registration form. And if you want to get the guide you through much of the process then a local business support organization may be able to do it. But, if you need more specialized assistance in establishing your business then consult a lawyer and accountant. As a custom T-shirt business is not unlike any other business, the basic process will be similar, but specific permits may be necessary for your industry. Based on your research and financial projections, you need to purchase or lease a space with a storefront and production space. It will be adequate to take a small storefront space with enough room to consult with clients. Depending on the size of your screen printing station, you need to take the production area. But, you can do one thing that starts out with a small station and expands when your business grows. And based on your research, purchase your screen printing station and the other supplies you’ll need. Now, you need to enter into an agreement with a T-shirt supplier, which is based on your research. On the brand of T-shirts you offer, your target market will depend. Although many popular lifestyle brands such as Bangladeshi Apparel would be appropriate for bands, potential business clients may prefer work-oriented brands. Develop an interactive website for your business and you should work with a web designer in this purpose. So, consider setting up an online portfolio once you have some completed projects you can display as you’re selling custom T-shirts. Also, if you can provide a wide variety of designs for many different businesses and organizations you can showcase your ability. In order to sell through your website to market your business, make a few novelties T-shirt designs. And to encourage interactivity on your website, create a forum there. When you’re ready with your custom t-shirt business, advertise your business in local newspapers. Also, consider joining your local chamber of commerce. If you join to network with local business owners then you can take advantage of the opportunity. And they may come in a work in need of your services when you have a good relationship with the business owners. Since nearly every organization or business has printed T-shirts or other apparel for their company, every new contact could be a potential client.